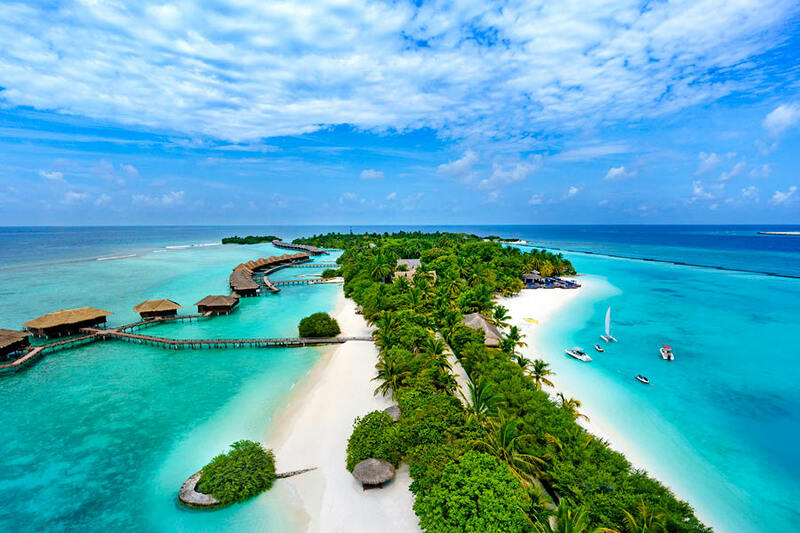 7 Nights in Maldives, 3 Nights in Singapore, Flights, Transfers + $3000 Bonus Value! Settle into the stylish outdoor furniture on your private balcony in your Beachfront Deluxe Room! Featuring timber blinds, tiled floors and with unobstructed sea views and easy access to Indian Ocean, this is the perfect room to make the most of the sunshine. Complimentary room upgrade from a Deluxe Room included! Enjoy 3 nights in a deluxe room when you stay at Singapore Marriott Tang Plaza Hotel. For stays between Thursday to Sunday, guests can enjoy a complimentary room upgrade* to a Premier Deluxe Room. 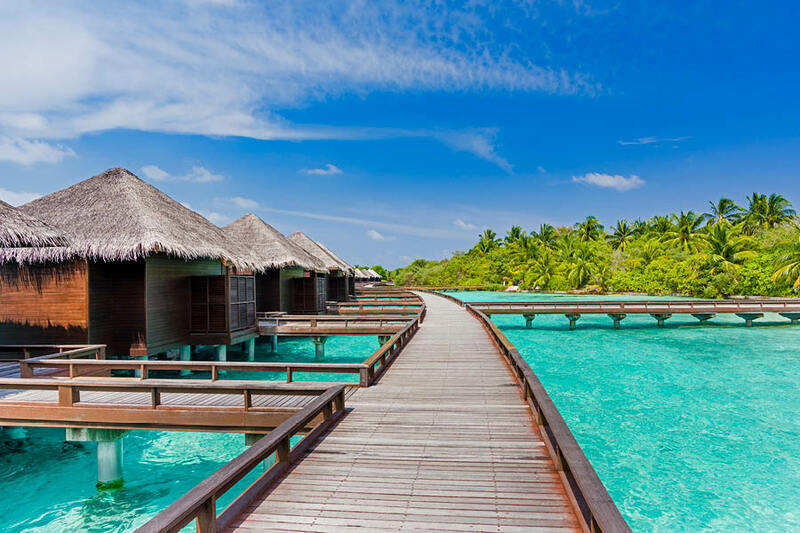 The best time to indulge is on holiday, and thankfully with this My Maldives package, you can do just that! Choose one special night of your stay to enjoy a complimentary 3 course dinner at Sand Coast Restaurant for 2 guests. Two guests can relax and unwind with a 30-minute massage. Using ingredients derived from the natural Maldivian environment, the spa’s therapists harness the healing power to rest and renew you. Two guests can go on a journey off the resort island and explore the diverse sights of the Maldives on a traditional Maldivian Dhoni. Spot dolphins in the crystal-clear waters on an excursion you won’t soon forget! Find a gift pack in your room to make your stay even more special. Enjoy a glass of wine and indulge in some chocolate to start your holiday the right way! 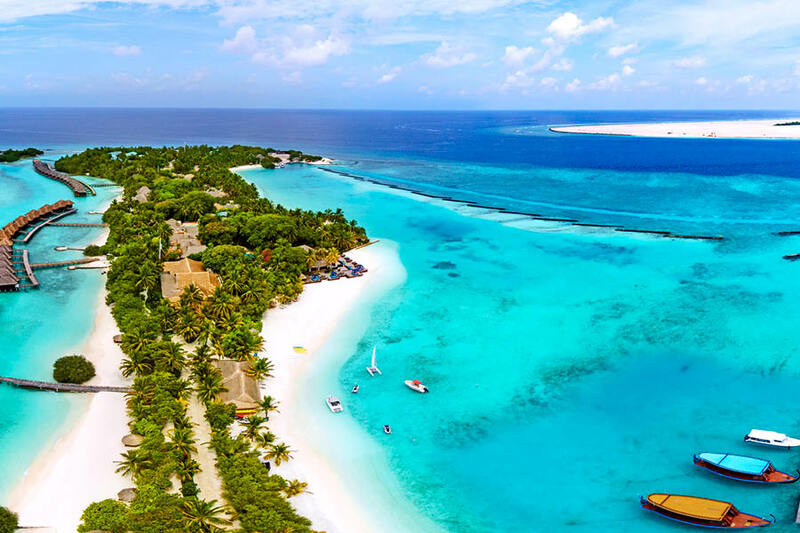 Contact My Maldives team for a quote for travel during peak periods, surcharge applies. Unwind in the cosy and elegant ambiance of your Deluxe Room designed and built by local craftsmen. Recently refurbished with timber blinds and pretty tiled floors this is the perfect tropical setting to enjoy your Maldivian holiday in. Deluxe Rooms feature individually controlled air-conditioning and ceiling fans to keep cool your way and a bathroom with a shower and separate vanity to enjoy your own privacy. All rooms are complete with a 40” plasma flat screen TV, safe, family room and more. This room is 52m² and fits up to 2 adults & 1 child. Settle into the stylish outdoor furniture on your private balcony or terrace and take in the unobstructed sea views from your Beachfront Deluxe Room. With easy access to Indian Ocean this is the perfect room to make the most of the sunshine in the incredible Maldives. Beachfront Deluxe Rooms feature timber blinds, cooling tiled floors, individually controlled air-conditioning and ceiling fans and a private bathroom with a shower and separate vanity. All rooms are complete with a 40” plasma flat screen TV, luxurious king and day bed, family room, safe, tea/coffee making facilities and more. This room is 52m² and fits up to 2 adults & 1 child. Island Cottage – UPGRADE from only $450 per person! Find the perfect oasis under one of the secluded thatched roof Island Cottages. Only steps from the lagoon with impeccable views of lush tropical gardens, it’s the ideal location for leisure and relaxation. 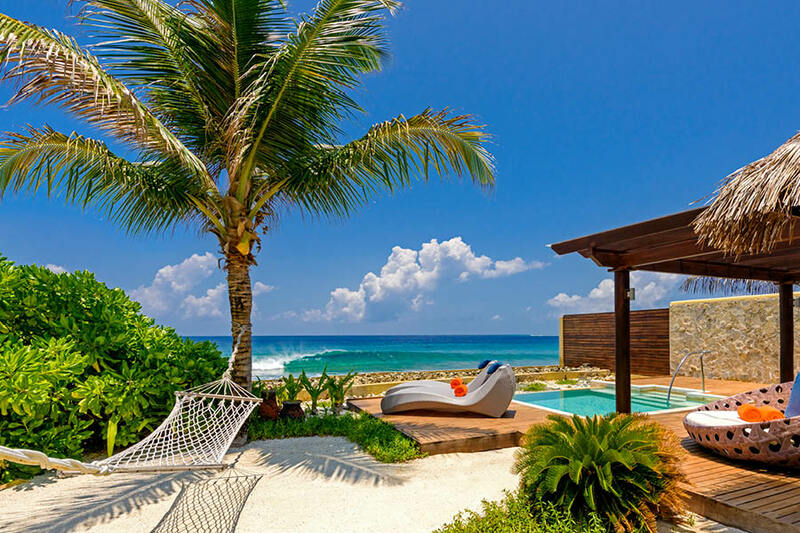 Island Cottages feature outdoor showers and private balconies with a day bed for the ultimate morning, afternoon or evening. All rooms are complete with the comforts of a 40” plasma flat screen TV, bathroom amenities, safe and tea/coffee making facilities. This room is 76m² and fits up to 2 adults & 2 children. Beach Front Cottage – UPGRADE from only $700 per person! Your Beachfront Cottage: 76sq. metres of pure bliss. Step out onto your rambling private terrace meeting the pristine sand’s edge and overlooking the captivating turquoise sea. Bath in your exotic open-air bathroom as you delight in the revitalising, flower-scented breeze gentling dancing throughout your cottage. Want for nothing more with air-conditioning, kitchenette, 24-hour room service, minibar, high-speed Wi-Fi, flat-screen TV, working desk and evening turndown service. Slip into your lavish robe and slipper, nurture your complimentary cup of tea or coffee and watch the tropical world go by from your serene terrace. 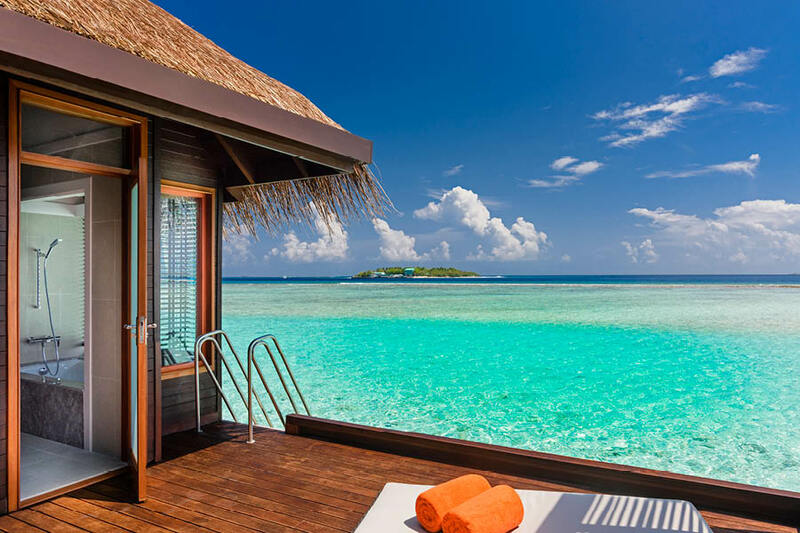 Water Bungalow – UPGRADE from only $1150 per person! Located on the northern end of the resort for pristine views and uninterrupted relaxation are the waterfront bungalows. Built on stilts over the lagoon you’ll be able to access the crystal clear waters straight from your private sun terrace. Each room features a 40” plasma flat screen TV, bathroom amenities, in room safe and tea/coffee making facilities. This room is 54m² and fits up to 2 guests. Cottage with Pool – UPGRADE from only $1150 per person! Nestled within the privacy of tall, vibrant greenery is your Cottage with Pool. A luxury haven for couples seeking romance or a small family looking for a tranquil getaway in the Maldives, this 76sq. metre cottage features your very own sprawling pool, perfect for a refreshing morning plunge or dreamy midnight swim under the stars. Modern facilities such as air-conditioning, evening turndown service, 24-hour room service, minibar, high-speed Wi-Fi and a flat-screen TV are second nature here. Unwind in your deep-soaking bathtub, snuggle into your plush robe and slippers and savour complimentary tea and coffee. Every amenity including a work desk and mini-refrigerator has been thought of. Learn the peak of ease and tranquillity first-hand in your Cottage with Pool. Club Water Bungalow with Pool – UPGRADE from only $2150 per person! For the ultimate romantic stay, indulge in the comforts of a Club Water Bungalow, lounge on the terrace with your own private pool and admire the stunning clear waters of the Indian Ocean Roll by. With modern technology inside the bungalow along with all the comforts of a 40” plasma flat screen TV, bathroom amenities, in room safe plus much more! It truly makes for an unforgettable stay. This room is 54m² and fits up to 2 adults & 1 child (over 8 years old). 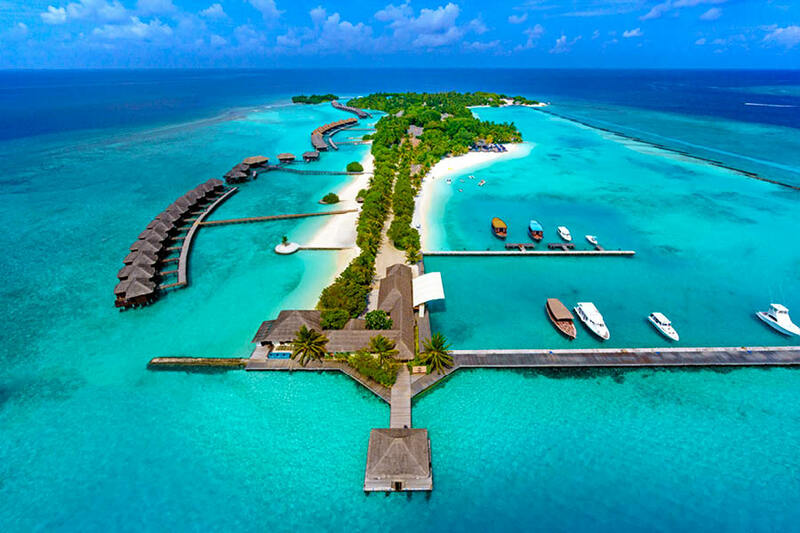 Discover your own 1 kilometre stretch of paradise at the Sheraton Maldives Full Moon Resort & Spa. With unlimited activities and 7 outstanding restaurants, bars, and lounges to dine at, you’ll be spoilt for choice on this palm-fringed island. Escape the world and feel the island vibes in no time—this incredible resort is just 15-minutes away from the capital! The safety and welfare of our guests is vert important to us. The design of our Water Bungalow, Water Bungalow with Pool, Water Villa and Water Suite is such that for children under 12 years of age a waiver must be signed by their legal guardian. *Guaranteed upgrade to Premier Deluxe Room at Singapore Marriott for stays Thursday to Sunday. If your total stay crosses over into Monday to Wednesday nights, the upgrade will apply for the whole stay as long as 2 consecutive nights fall between Thursday to Sunday. 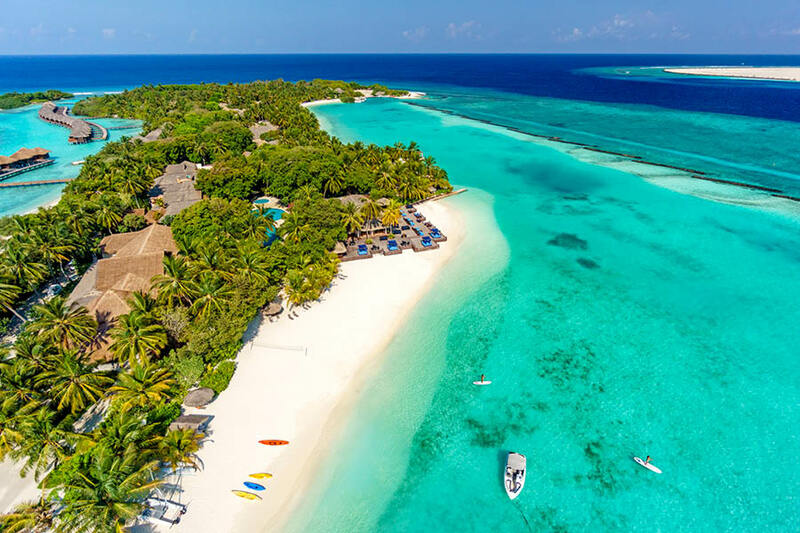 **Complimentary Non-Motorised Watersports at Sheraton Maldives: Free non motorised watersports includes snorkelling gear, kayaking & stand up paddle boarding. Excludes windsurfing. Charges apply for excursions or guided activities.